Steve's sister, Deb, and I share a love of cooking. 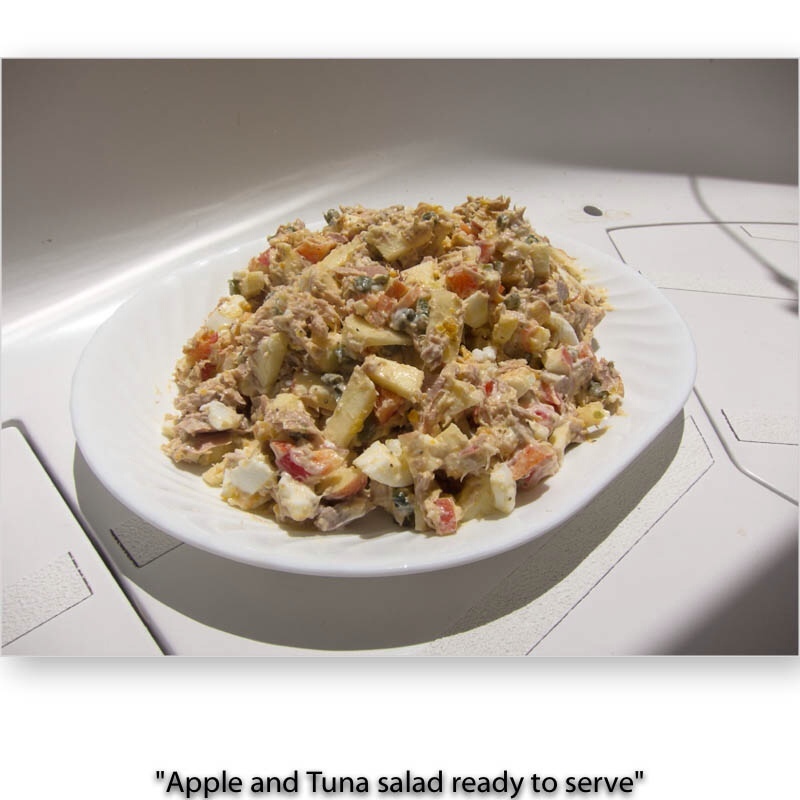 This recipe arrived recently in an email message, and it looked so delicious that I had to include it. 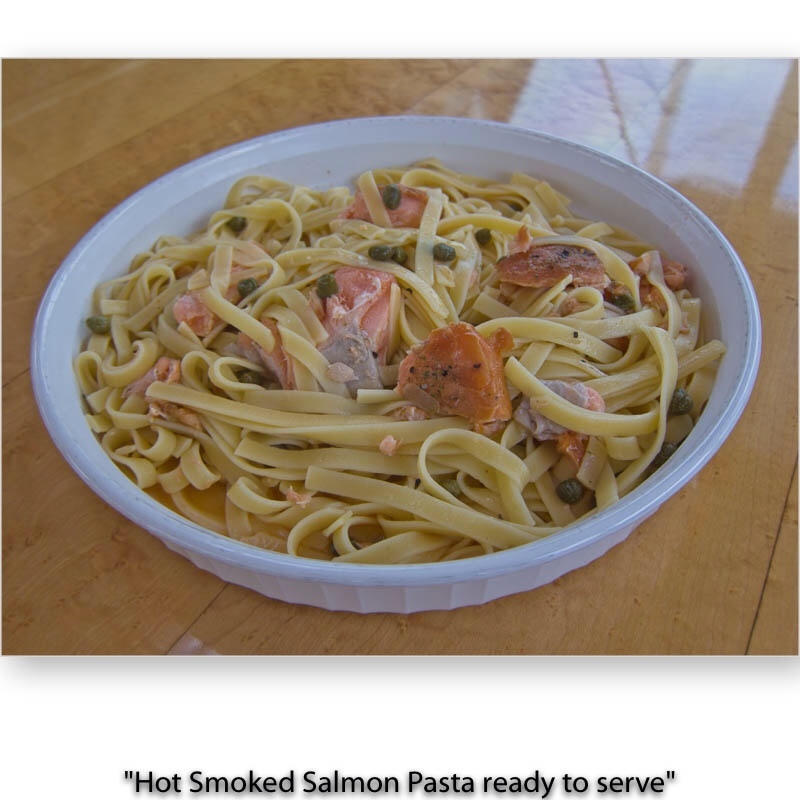 “We came up with a great, easy recipe for salmon that I thought you might like. Rub the fish all over with Red Thai Curry paste. Poach the fish in coconut milk until just tender. When we were aboard ADAGIO in Bainbridge Island, Washington, USA, we were introduced to the numerous “rubs” sold under the brand name of Tom Douglas. Our favorite was the Salmon Rub. 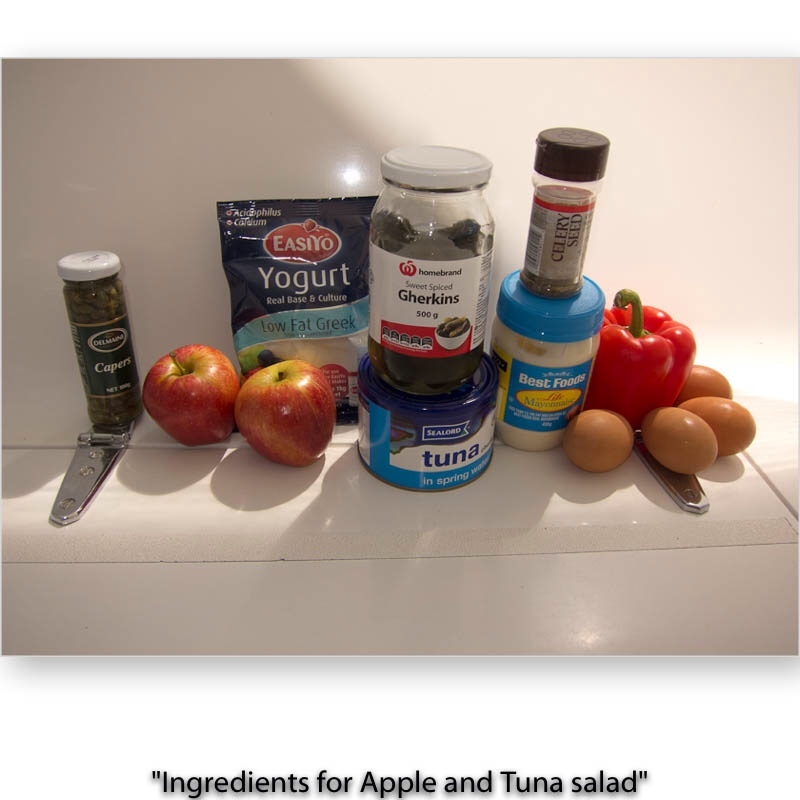 We are unable to buy this rub in New Zealand and Australia, so we reverse-engineered the recipe. Here is is. Be sure to use Sweet Smoked Paprika, NOT HOT Smoked Paprika. Heat a Wok on High heat. Place fillets of Salmon into the hot oil, first one side then the other to coat both sides with oil. Sprinkle Salmon Rub onto the fish. Turn the fish over, and add more Olive Oil to the pan if necessary. Sprinkle the Salmon Rub onto the second side of the fish. Cook for another minute, testing for doneness. When the fish is just flaky but still a little soft in the center, remove it to a heated plate and cover. Deglaze the pan with a little white wine, and pour over the fish. This recipe was inspired by Ruth Reichl's “The Courmet Cookbook”, and by Steve's and my visit to Argentina, where the Chimichurri Sauce is traditionally served with Carne Asada, a delicious grilled beef dish. Quick to prepare, and quite tasty. Serves 2 people as a main course. 3/4 pound Ahi Tuna in 2 pieces, each about 1 inch thick, brought to room temperature before cooking. Heat the Canola oil in a Wok or skillet, over High heat. Reduce the heat to Medium, and place the Tuna in the Wok, turning over to coat with Oil on both sides. Cook for several minutes per side, until browned on both sides, and still soft in the center. Serve the Tuna with the Chimichurri sauce on the side. I recommend a loaf of Ciabatta bread, or other crusty bread and a green salad as well. In New Zealand, there are many excellent types of wild fish in addition to farmed salmon. 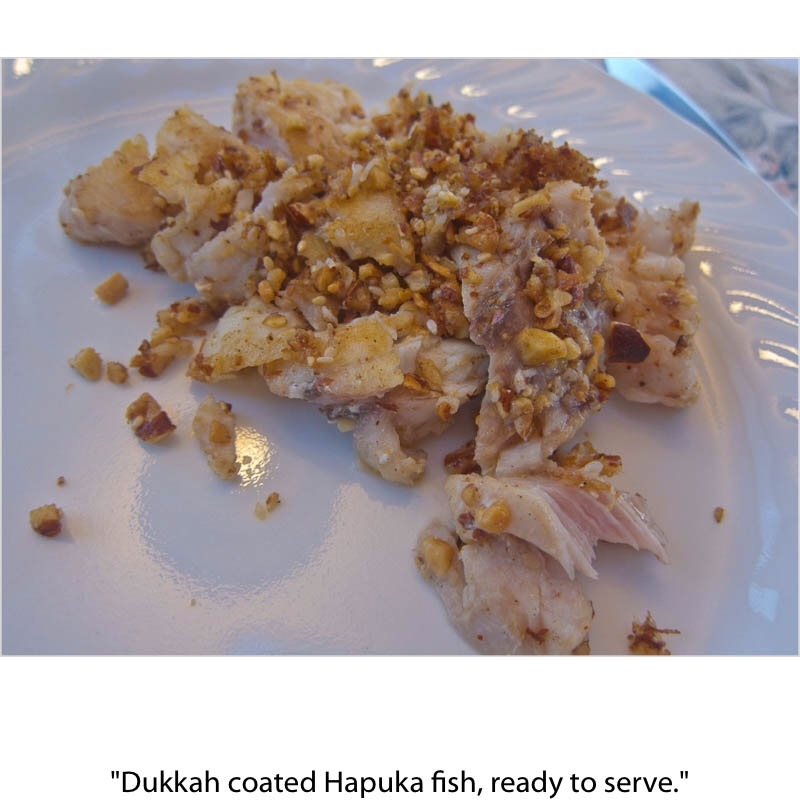 Our favorites are Hapuku (a kind of Grouper), Snapper and John Dory. These are all firm, white-flesh fish. You will find the recipe for Dukkah elsewhere in this blog. We keep it on hand for use in main dishes like this one, and in appetizers. 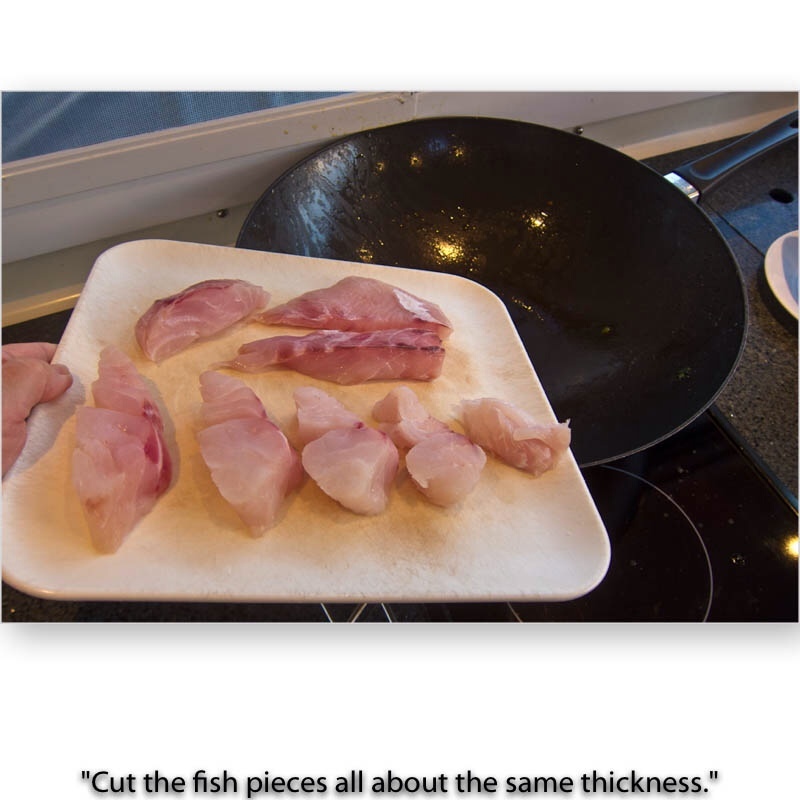 Fillets of firm white fish, with or without skin, all cut to about the same size, and not much thicker than your thumb. Heat the oil for a minute over High heat. Add Fish fillets to the hot oil, then turn over to cover the fillet with oil on both sides. Add more oil if you think it is necessary to keep the Fish from sticking to the pan. Turn Fish pieces over and sprinkle with more Dukkah. Cook until just before done, another few minutes. 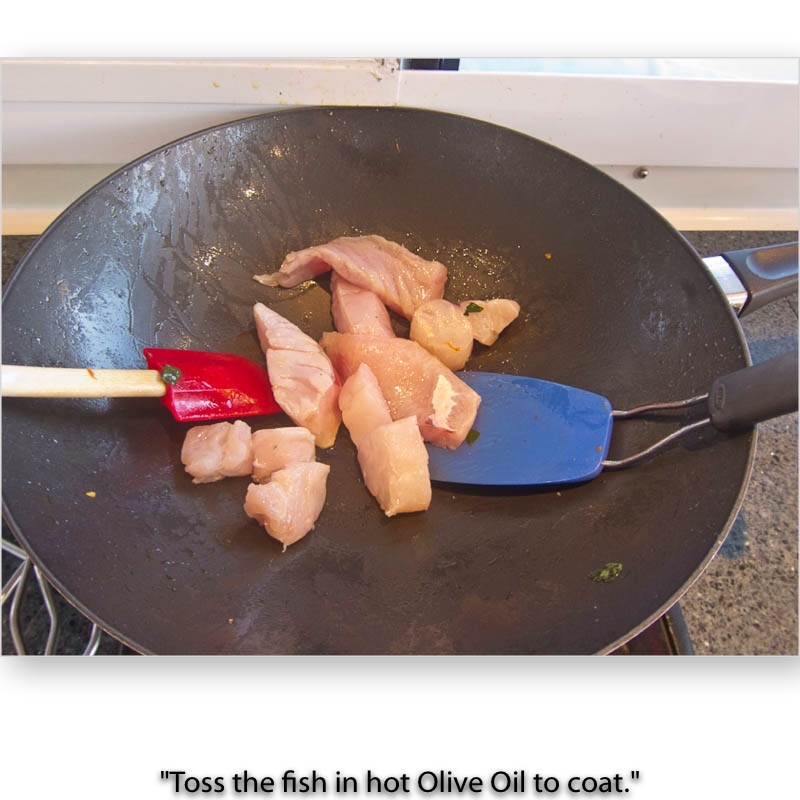 With a spatula, remove the fish from the Wok onto a preheated plate. 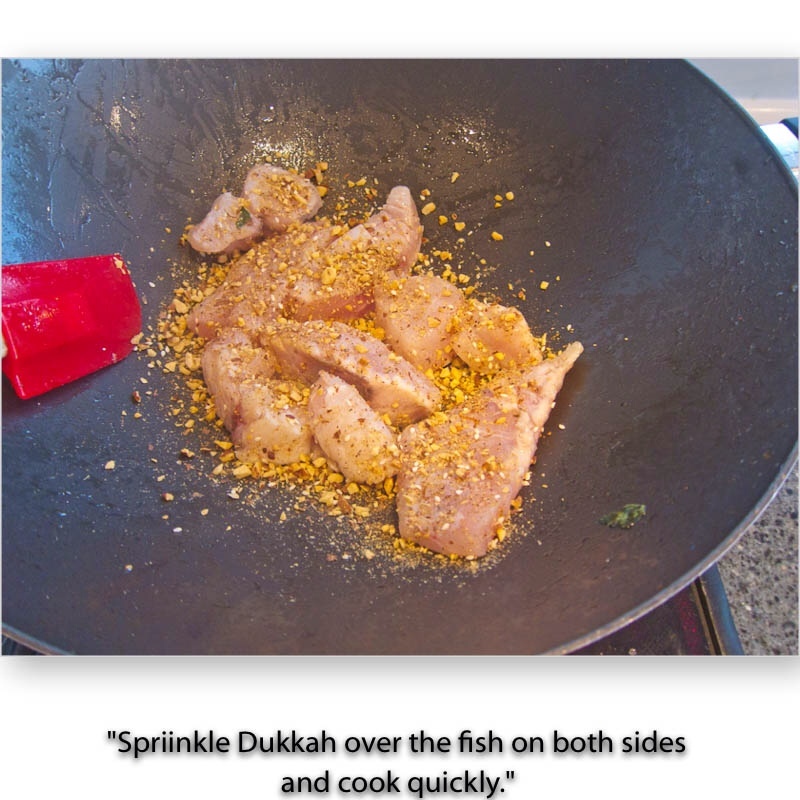 Scrape the Dukkah bits out of the pan and sprinkle over the fish on the plate. This can't be beat for a really quick and nutritious meal. We try to keep a small supply of hot smoked salmon in the bottom of our fridge for such an occasion. 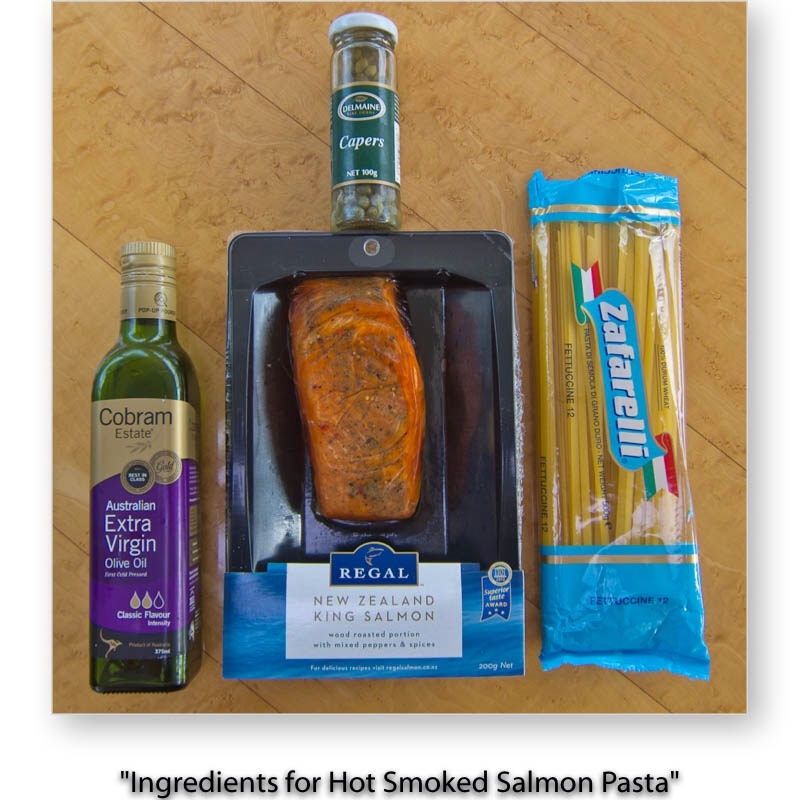 Choose salmon that is flavored with cracked pepper, Italian seasoning or something similar. The key to success is to cook over High heat, in a well-oiled Wok or skillet, and lift and fold the eggs. Don't stir the eggs. Cook until just tender and still moist. Heat the oil in the skillet or Wok. Add the Salmon, and toss to heat through. Move the Salmon to one side of the pan. Add the Eggs and allow to set for 15 seconds. With a spatula, scrape the egg off the bottom of the pan, and fold the eggs slowly, keeping them away from the Salmon at first. Incorporate the Salmon into the Eggs and cook for a short time more, making sure the eggs are just tender, and not overcooked and dry. 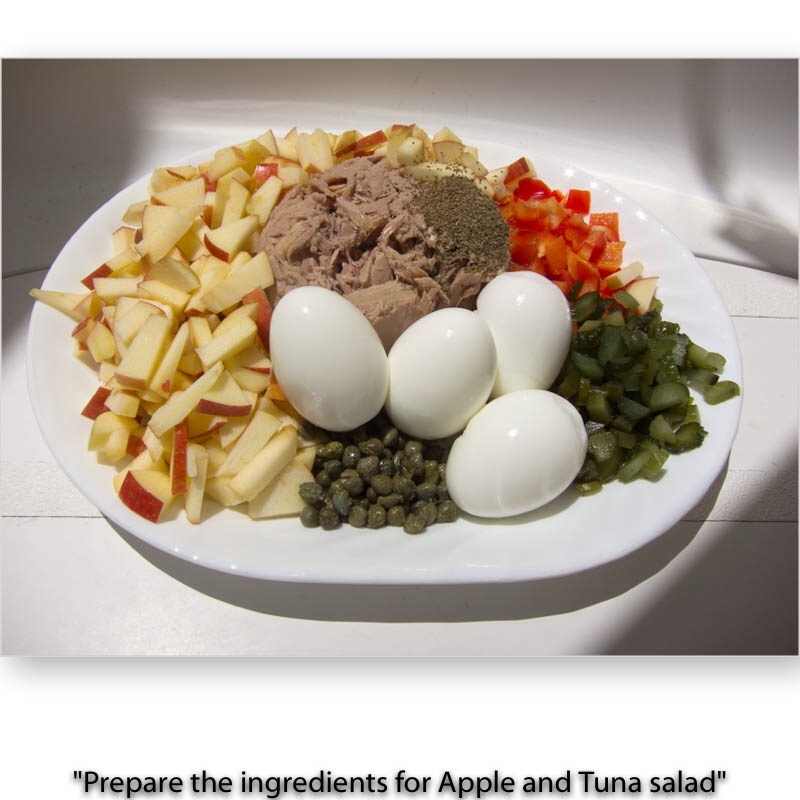 Serve on two plates with fresh fruit or salad.